The RP Photonics Buyer's Guide contains 17 suppliers for beam shapers. Ask RP Photonics for advice on what a beam shaper can do in your application. In general, a beam shaper (or beam converter) is an optical device which somehow reshapes a light beam, i.e., it modifies its spatial properties. For example, there are refractive and microoptic beam shapers which create a flat-top (top-hat) beam from a Gaussian input beam. Another kind of beam shaper is often used in conjunction with a high-power laser diode, for example with a diode bar, in order to make both its beam radius and beam quality more symmetric with respect to two orthogonal directions. This facilitates e.g. launching the beam into an optical fiber with a circular cross-section, or pumping a solid-state gain medium. A popular type of device, which is based on two highly reflective mirrors and largely preserves the brightness, is described in Ref. . Other devices are based on micro-optical structures, for example containing arrays of small prisms, to perform a similar function with a smaller device. Originally, such brightness-preserving beam shapers were applied to diode bars, but they can equally well be used with diode stacks. 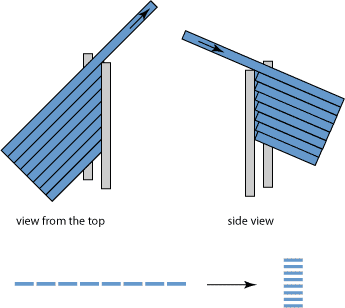 Figure 1: Setup of a two-mirror beam shaper . The lower part shows how an array of beamlets from the emitters of a diode bar is rearranged so as to obtain a roughly equal beam quality in both directions. Note that it would not be sufficient simply to use a combination of cylindrical lenses so as to achieve equal spot sizes in both directions; the beam qualities and thus the beam divergence angles in both directions would then remain very different. If a circular focus is formed in that way, the beam divergence at least in one direction is much larger than achievable with a beam shaper. There are other devices performing essentially the same function with other means, e.g. with diffractive microoptics or with fiber bundles. In the latter case, the outputs of individual emitters of a diode bar are coupled into separate fibers of a bundle, which are arranged in a linear array on the side of the diode bar, but as a circular array on the output end. Other beam shapers perform different functions. For example, there are devices for correcting the “smile” of diode bars . Finally, there are beam homogenizers for making its intensity distribution more uniform.